As it becomes more difficult to sell music via traditional channels, consumer data becomes more significant; the more you know about how, what and where people are listening to music, the more you can tailor your marketing approach. While this is true for every market, it seems that the music industry is only now beginning to leverage the new wealth of information that has been gathering over the past decade or so. 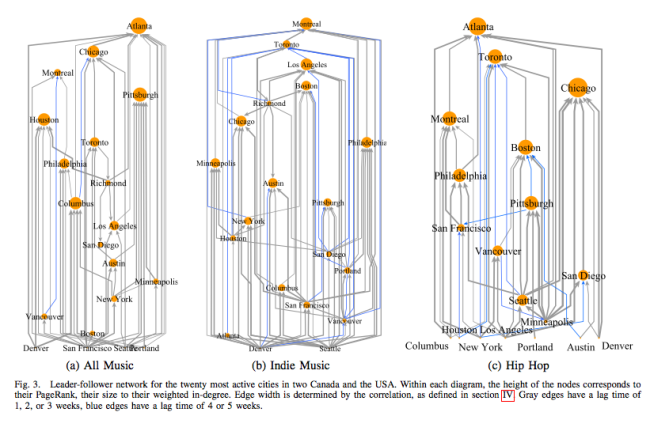 Conrad Lee and Padraig Cunningham in UCD have used Last.fm scrobble data to perform an analysis called ‘The Geographic Flow of Music‘. in the digital music category.